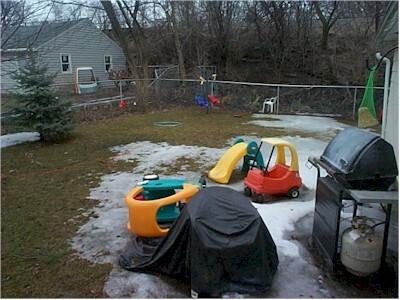 Thought I'd include this photo of melting snow for my kids, since they've never seen it before. This is Bobby's backyard. When I arrived, it was covered with snow. It got a couple of additional thin layers of powder during the week, then melted significantly on the weekend. I like the colors back here. Their trees are growing well. I spotted two cardinals, male and female, in the trees behind the fence. We don't see those in San Diego either. Bobby may start construction of a little, screened-in sun room adjacent to the garage out here. Once he and Cindi get done with the kitchen, they won't know what to do with themselves until a new project begins.